Five Star Trails Orlando presents the best hikes within an hour of Orlando, Florida’s epicenter of spectacular hiking trails and a launch pad to outdoor adventure. Discover hidden gems like Trimble Park, set between two lakes with breezy nature trails and a continual parade of wading birds. Get perspective in the middle of a vast palmetto prairie at Wiregrass Prairie Preserve. Take the tots on a gentle walk at Green Spring Spark to a shimmering spring where an ancient civilization once camped. Or grab your daypack and challenge one of the toughest loop hikes in Central Florida at Triple N Ranch in the floodplain of Crabgrass Creek. 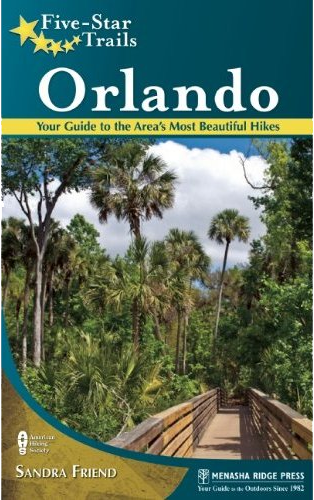 Covering 37 hikes across a compact five-county region, all within an hour’s drive of downtown Orlando and the theme parks, Five Star Trails Orlando gives you a reason to get outdoors now. The guide offers a mix of gentle, family-friendly nature trails, easy day hikes, and more strenuous immersions through vast wild spaces, as well as popular portions of the statewide Florida Trail, our National Scenic Trail in Florida. Vivid hike descriptions provide insight to the history, flora, and fauna along the trails. Paperback, 250 pages. Kindle edition available.